Grace, the paper's current Online Editor, will replace Niamh Lynch in May. 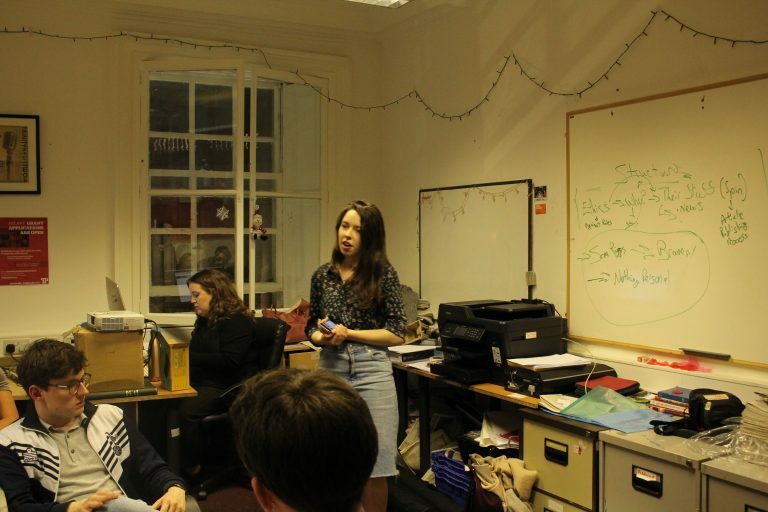 Aisling Grace has been elected the next editor of Trinity News, after being elected by the paper’s editorial staff at its AGM this evening. Grace, the paper’s current Online Editor and former Deputy News Editor, ran unopposed for the position. She was elected by secret ballot after a questions-and-answers session with members of staff. She will take over in May and lead the paper in its 66th edition. As well as Grace’s election, the AGM also included a report on the progress of Trinity News this year. Graduating senior members of staff also delivered speeches at the AGM. Lynch was elected last year after defeating Rory O’Neill to the position. Trinity News is one of the constituent publications run and funded by Trinity Publications, a body funded by students. An earlier version of this article incorrectly stated that Niamh Lynch defeated Rory O’Sullivan to become Editor of Trinity News. In fact, Lynch defeated Rory O’Neill to the position.